This rare find is a vintage Delco DC-12 battery box and display. This valuable antique is a display shelf for placing a cardboard box-packaged Delco DC-12 battery on. The display is a bright blue shelf, that reads, “100% fresh” in yellow text. Attached to the display portion on the right is the Delco man in green pants and a blue and white vertical stripe shirt. He is smirking and pointing to the battery box (where it should be displayed). The battery box is brown cardboard with red printing to identify the battery type. 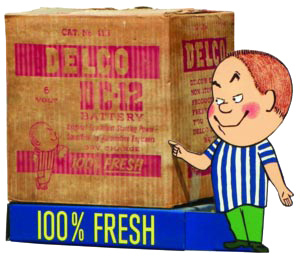 It reads, “Delco / DC-12 / battery,” and also features the full-figure Delco man.